While visiting Swindon’s out-of-town John Lewis at Home, I also managed to spent some time exploring the town centre. The open-air Parade shopping centre has the distinction of hosting one of the UK’s few (as yet) new-concept BHS stores, reviewed by Retail Week’s John Ryan shortly after its June opening, and described by him as “without doubt the best shop in Swindon.” Given the store’s similarity to the new BHS shops that will be opening soon in Hartlepool and Newcastle, I was keen to take a look for myself. Meanwhile, in Newcastle, BHS’s planning application to revamp the old Next store was ‘granted conditionally’ last month. The core design is unchanged, though the main logo (now slightly smaller) and building surround (now York stone instead of aluminium) have been tweaked in response to council officers’ criticism of the original proposals. At this stage there’s no official opening date, but Arcadia’s PR person tells me that an opening early next year is now more likely, rather than the autumn of this year as had been originally planned. Given the scale of building work involved, that’s not terribly surprising, particularly as any new store would ideally want to open well before Christmas rather than in the midst of festive trading. 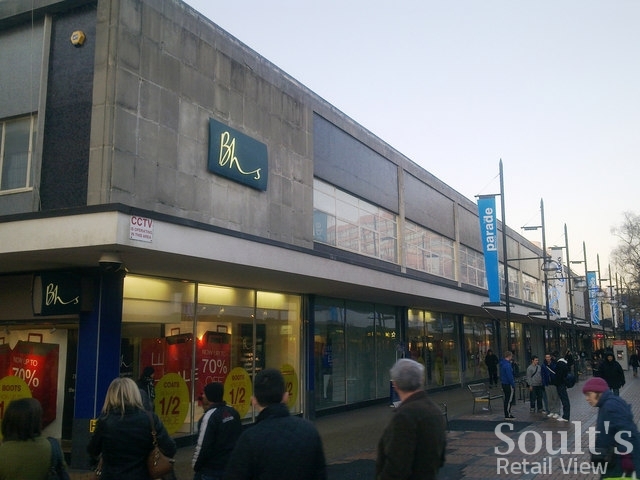 While the upcoming BHS stores in Hartlepool and Newcastle involve a comprehensive revamp of existing buildings – including, in both cases, a new frontage – Swindon’s is a complete new build, constructed on the site of the previous rather tired BHS store (above). 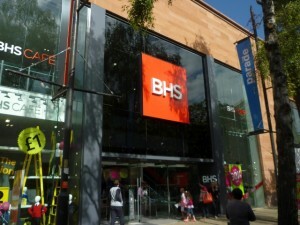 Many older BHS shops, such as the now-closed Newcastle store, feel sprawling and overspaced, and it’s telling that the redevelopment has provided room for a more compact, two-storey BHS (but still with a selling area of 27,000 sq ft) as well as several other new arrivals – Topshop/Topman, USC, and a funky and eyecatching River Island. 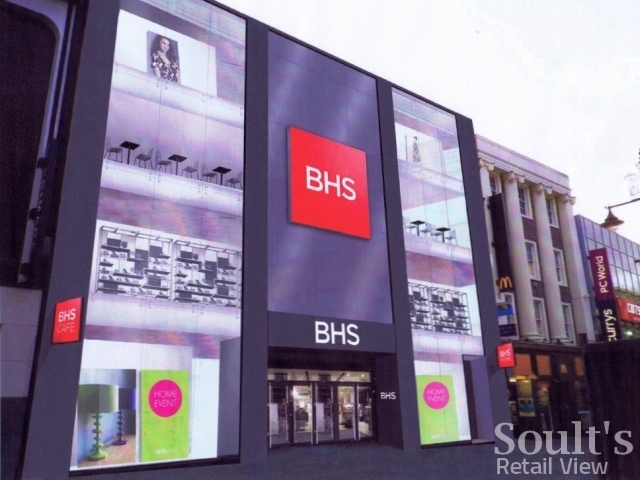 On the outside, the BHS store’s double-height glazing, bold signage and stone surround all give a real flavour of what we can expect to see on Newcastle’s Northumberland Street. Inside, the joy of the new shop is that it still feels roomy, as well as much brighter and fresher than the BHS stores of old. Crucially, the infusion of natural light and more compact footprint ensure that the store has none of the dark and dreary corners that characterise BHS’s older estate. 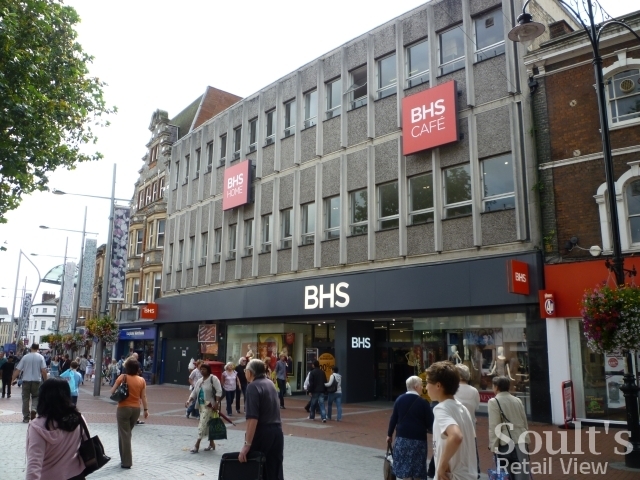 For example, rather than being hidden away at the back of the store, the BHS Café is now a core part of it, its location at the front of the first floor offering great views over the busy street. Similarly, the lighting department – always a BHS strength, yet not always showcased to best advantage – sits in the middle of the first floor, providing an immediate wow factor as you step off the escalator. Indeed, throughout the store, it’s remarkable quite how much the modern setting enhances the visual appeal of BHS’s own-label product. Where the first new-concept store in Uxbridge featured several Arcadia concessions – as introduced previously in locations such as Middlesbrough – Swindon’s is what John Ryan terms a “monobrand BHS store.” Given the existing strong presence of Arcadia’s other brands in Newcastle, I’d expect the Northumberland Street store to have a similar focus on BHS’s own ranges, though its four-floor configuration will create new and interesting opportunities for display and navigation. 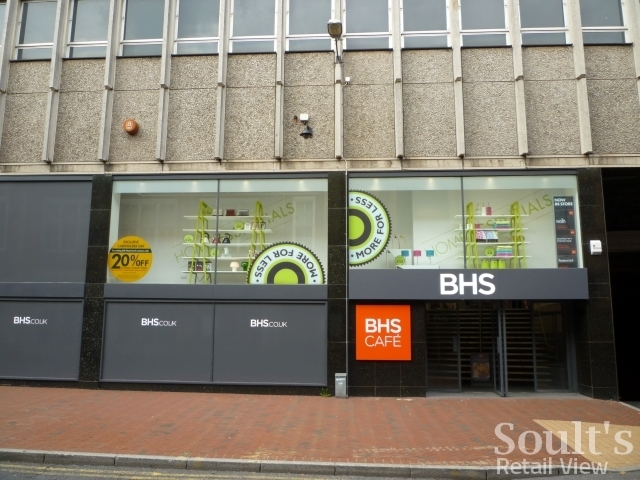 The problem, of course, is that shiny new BHS stores reinforce quite how tired many of the older ones are – and with a 183-strong estate, updating all of them fully to the new format will be both costly and time consuming. Reading, for example, has had the new logo applied to its existing street frontages; it’s a slightly clunky juxtaposition, however, and almost makes one long for the storefronts to be given a Swindon- or Newcastle-style full-on makeover. 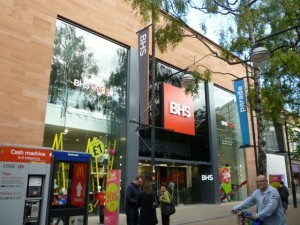 As I’ve observed previously, some BHS stores seem to have had little or no investment in the last twenty years. 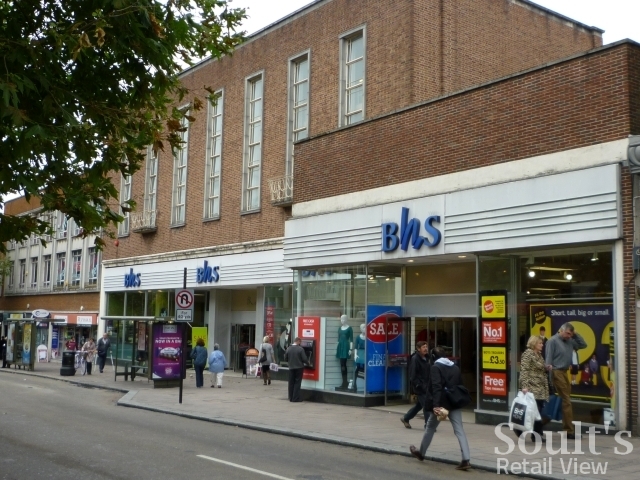 In Exeter last week, for example, I spotted an unmodernised BHS still featuring the old ‘ribbon’ logo that was replaced in 1995. 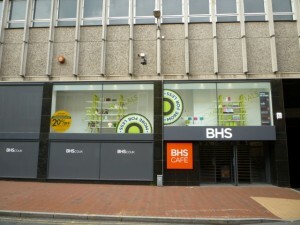 As if to emphasise the point, the store also featured the signature logo (1995-2010) over one of the entrance doors, and the new capitalised logo (2010-) on its window posters. 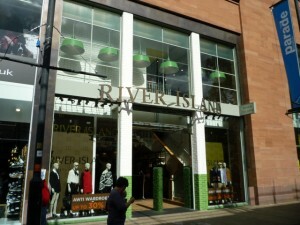 In a city that has a new Debenhams, a decent House of Fraser, and John Lewis on the way, this really isn’t good enough. Assuming the new BHS format is a success – and it is said, by the chain’s MD, to be “making a difference” – I suspect that we will see further stores relocating to more suitable premises, as has happened in Newcastle, potentially freeing up larger-footprint sites for other expanding retailers. BHS owner Sir Philip Green offloaded ten stores to Primark at the start of last year, at the same time as opening others, and there is persistent speculation that Primark might acquire more. 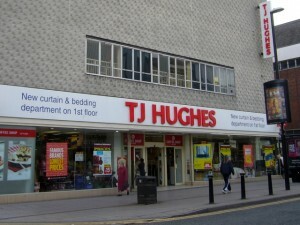 Meanwhile, just as BHS has taken advantage of Woolworths’ demise to move into Hartlepool for the first time, I’d be surprised if some of the 51 sites left vacant by TJ Hughes’ collapse don’t end up in BHS’s hands. 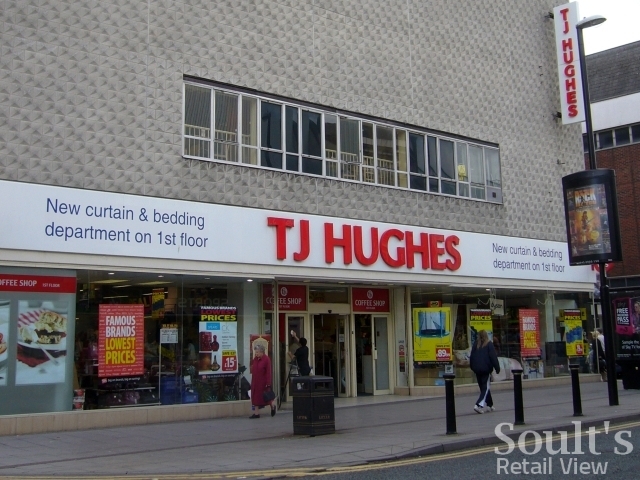 In Sunderland, for example, the TJ Hughes site in High Street West is more comparable in size to the Swindon BHS than the current small store opposite, while few people would complain if BHS wished to work its magic on the unremittingly ugly TJ Hughes store frontage. Whatever the exact permutations, I suspect that the next few years will see the BHS estate evolving into something that comprises slightly fewer but much better stores. 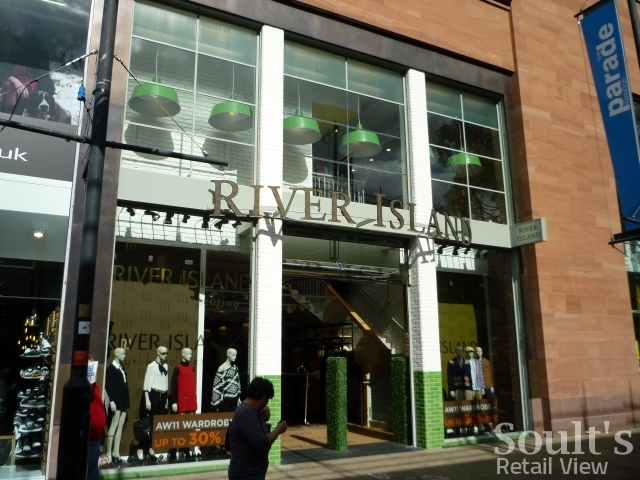 This is likely to be good for those locations that gain the new investment, good for shoppers, and good for the future of one of Britain’s most long-established yet historically undervalued retail brands. Thank you to Brian Robert Marshall for the shot of the former BHS in Swindon, which is © Copyright Brian Robert Marshall, and licensed for re-use under this Creative Commons Licence.